Every day it seems a new diet or exercise fad is popping up, each touting some questionable interpretations of science as justifications for its methods. Whether it’s juicing everything in sight or using weirdly sexual infomercial workout equipment, these “get thin” plans play into the America’s obsession with burning calories. 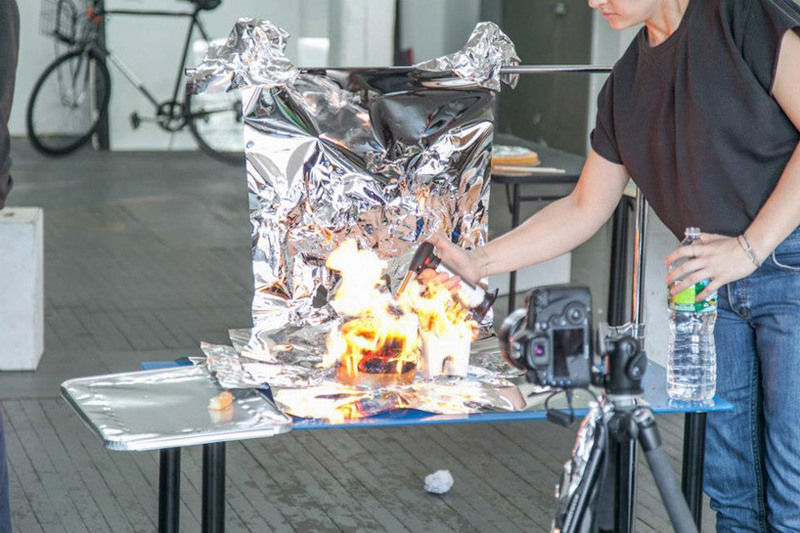 While most artists tend to present hot topics in abstract methods, Brooklyn-based photographer Henry Hargreaves (the man behind this piece of awesomness) has decided to go the more literal route. 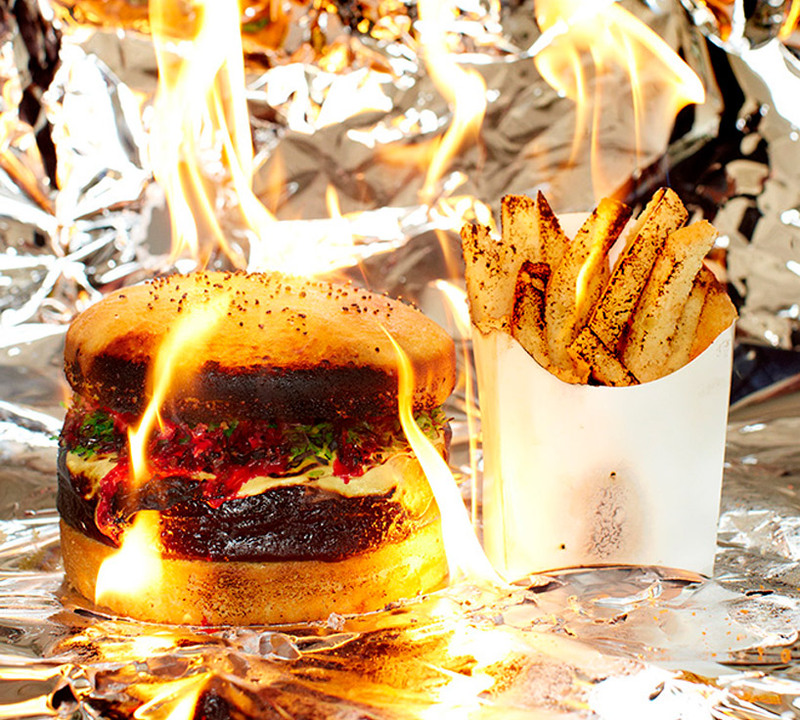 He believes that the only way to truly burn calories is to, well, set them on fire. 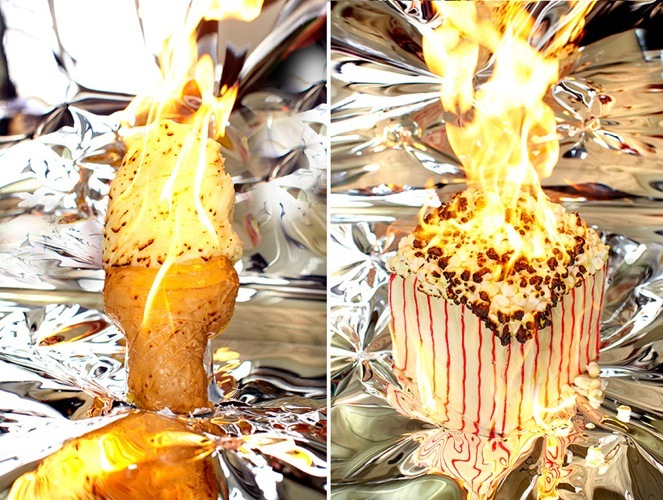 His latest project is a series of fast food dishes—think pizza, ice cream, and Chinese take-out – that are actually made out of cake by a local bakery, then set on fire with lighter fluid and a torch. According to Design Boom, Hargreaves explains the project like this: “It is not just in the people you see or the depressing facts about the significant health impact on individuals. 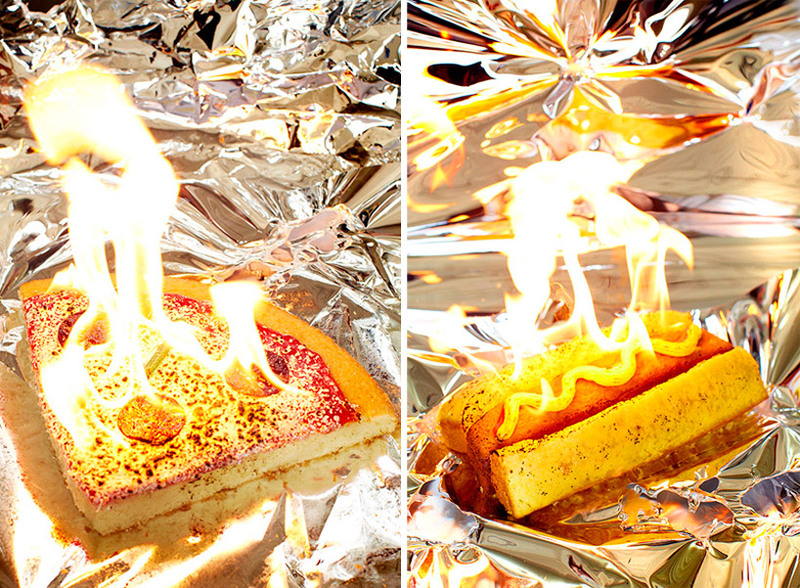 Calorific information, driven by the big brother mandates belief that knowledge is power, making it only inevitable to overcome temptation.” Uhh, okay, sure—flaming food is still sweet, though. Hargreaves isn’t the only one giving the middle finger to typical art mediums this week—junk food seems to be the go-to material of choice in the art world as of late. Famed British sugar artist Michelle Wibowo, known for her life-like cake replicas such as this one of The Queen, has managed to create a 40-square-foot portrait of the other Queen—Beyonce, natch—solely out of Oreo cake pops. The likeness began with a collection of 2,244 dark pops and 1,536 lighter pops, adding up to 3,780 pops in total. A casual six weeks of planning and eight hours of constructing later, a ‘pop-trait’ of Queen Bey was born. The hardest part about the project? “Trying not to eat it!” says Wibowo.